With another New Year’s Eve on the horizon, it becomes time once again to start setting plans for Dec. 31. If you live in or plan on visiting Ohio when 2016 crosses into 2017, you will be excited to learn that there is no shortage of things to do around the Buckeye State. The following are just a few examples of plans to make in Ohio this New Year’s Eve. Michaud’s Catering and Event Center in Cleveland is celebrating the start of 2017 this year with its annual New Year’s Eve Bash. Tickets for the event are $55 per person and includes admission from 5 p.m. to 2 a.m. In that time, attendees will be able to enjoy seven rooms of entertainment, which includes four live bands, a DJ and two comedy clubs. The event is BYOB, but the center provides mixers, soda, juice, cups, ice and all other accoutrements for your beverage-enjoyment needs. Food will be provided in the form of appetizers from 5:30 – 6:30 p.m. and a full buffet from 6:30-9 p.m. For more information on this year’s event, visit http://michaudscatering.com/new-years-2017. Fountain Square is where Cincinnati gets together to celebrate, and New Year’s Eve is no exception. The annual New Year’s Eve Blast takes place from 8 p.m. to 1 a.m. on New Year’s Eve and includes everything from music and dancing, to ice skating and delicious meals from local food trucks. Lucky attendees will have the opportunity to play games for prizes on the Fountain Square stage every 30 minutes, but celebrating with friends and loved ones at midnight is guaranteed. To learn more about this year’s event, visit http://myfountainsquare.com/event/new-years-eve-blast-2. The Dayton Performing Arts Alliance presents its annual New Year’s Eve celebration with a live performance that will include dancers from the Dayton Ballet, singers from the Dayton Opera and the musical accompaniment of the Dayton Philharmonic Orchestra. Starting at 8 p.m. and ending at 10 p.m. with a colorful balloon drop, the event has become a city staple that brings jubilant throngs to the Schuster Center in droves. Admission prices range from $25 – $74, and seats are likely to fill up quickly; to get your tickets, visit http://daytonperformingarts.org/philharmonic-performance/new-years-eve-american-vistas. One of the more unique New Year’s Eve celebrations takes place aboard the Hocking Scenic Railway in Nelsonville. The annual New Year’s Eve Train and Fireworks display starts at 10:30 p.m. and runs for about two hours, carrying passengers from the Nelsonville depot to East Logan and back, all while fireworks ring in the New Year. Tickets are available for $20 – $35 per person depending on your choice of section. Only adults will be permitted in the Wine and Cheese section, so attendees with children are advised to purchase for the Pizza and Pop section; no other alcohol will be permitted onboard, but outside food and non-alcoholic beverages are permitted. 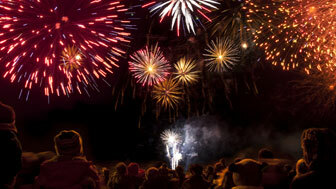 To learn more, visit http://hockinghills.com/events/Dec-31-2016_New_Years_Eve_Train_and_Fireworks.html. Ohio is not just the Heartland of America, but it is also one of the best places to celebrate both the passage of another year gone by and the start of a new beginning. Would you celebrate on a boat? Would you celebrate with a goat? No, this is not an excerpt from a Dr. Seuss book; it’s a preview of your New Year’s Eve opportunities in Ohio. With movies, celebrities and more, the Buckeye State is more like a bulls-eye of entertainment and merriment. A spectacle in the capital city, First Night Columbus offers fireworks, live entertainment, activities and fun for all ages. Twenty years ago, the First Night initiative came to Columbus with an international alliance of more than 100 cities to showcase their visual and performing arts through NYE celebrations that are safe, affordable, fun and substance-free. The ‘Bus is transformed into a stage at Veterans Memorial and COSI and costs just $9 for pre-sale tickets. For more information, visit http://firstnightcolumbus.com. Want a Times Square-like atmosphere without having to deal with the New York City crowds? Come to Cleveland Rocks NYE. It is a free event in the city’s central Public Square and it includes live entertainment, ice sculptures, refreshments as well as an enthralling fireworks display as the calendar turns to 2015. Special guests are slated to stop by to provide even more entertainment (for example, Cleveland-native Drew Carey was the “special guest” last year). For more information, visit http://newyearseveplan.com/cleveland-nye. In Cincinnati, a city dissected by the Ohio River, why not spend your New Year on the Ohio River? Take the BB Riverboats New Year’s Eve Cruise, which runs from 9 p.m. until 1 a.m., and cruise on into 2015. The great city’s sparkling skyline provides a captivating backdrop, especially as the fireworks explode at midnight. Enjoy a three-entrée buffet, late-night snacks, party favors, enchanting entertainment and a champagne toast as the clock strikes midnight. For more information, including booking, visit http://bbriverboats.com/new_years_eve_cruise.html. Noon Year’s Eve at the Toledo Zoo, one of the 10 best zoos in the United States for kids, according to “Child Magazine.” Starting at 11 a.m., come see the 5,300 animals representing more than 760 species; partake in cool crafting; enjoy ice carving demonstrations; and party with music, games and prizes brought to you by Radio Disney. As the ball rises at the stroke of noon, toast to the upcoming New Year with apple cider. And don’t forget to make your resZOOlutions while you’re there. For more information, visit http://www.toledozoo.org/site/program/395. The big cities aren’t the only places with epically huge New Year’s Eve celebrations. Holiday Auto Theatre, located about 35 miles from Cincinnati, offers a different position. One of the few drive-ins left these days, you can come here to watch four movies on the big screen while still partaking in a countdown to midnight and an apple cider toast. For more information, visit http://holidayautotheatre.com. Make a magnet tray. All you need is a baking sheet, some flat magnets and a glue stick. You can magnetize a notepad of paper and markers, or anything else you could imagine. You can also paint a scene on the magnetic sheet before the trip and get corresponding magnets for your kids to play with. For example, paint a barn and a field on the sheet and buy a set of farm animal magnets or stickers (magnets are better because they are removable and, thus, lead to extended play time). Magnet trays are great because utensils will not roll off and onto the floor, causing you to have to turn around and dig under the seats for crayons. Create a dry-erase book. A binder, plastic page protectors, and dry-erase markers are all you need to enable hours of entertainment for your children. You can look up printable games or coloring pages on the internet or create your own. Slide the sheet of paper inside the plastic and let your children go to town. The marker will just wipe right off; and not only off of the page protectors — dry erase marker spots are easy to remove from windows and car seats, as well. Buy “prizes.” These could be also known as “bribes.” Before the trip, go on a short shopping spree at the local discount store and get a bunch of small toys. Then give one at a time to your children if they are behaving, i.e. no whining, no fighting with siblings, etc. It’s cheap and easy, but it makes for decent motivation for the kids to be good. Have a road-trip tracker. If you don’t want to hear a barrage of “Are we there yet?” throughout your trip, a road trip tracker will help. 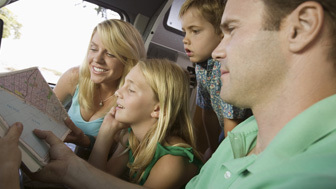 What’s more, it will keep your children looking forward to the next milestone marks you hit on the trip. You can make a road-trip tracker with just a thick piece of ribbon and a clothespin. Mark off a long piece of ribbon into sections based on how many cities or states through which you will be traveling, or by landmarks or time expectations. After you hit the next milestone, your kids will be exciting to see how far they have traveled and how much longer they have left in the car. Go back to basics. You can never go wrong with a pillow, blanket and some headphones. Download a book on tape, or a read-along, or just have your kids’ favorite music on hand with their most comfortable aspects of home (their favorite stuffed animals, for example). Chances are they will fall asleep and you will have some peace and quiet of your own for a while. Holiday road trips don’t have to be stressful. A little bit of preparation can go a long way when it comes to traveling with kids! New Year’s not only heralds the start of a new calendar year, it also is a time of hope and promise. As many across the world make resolutions and set their sights on a better tomorrow, the joy of new beginnings rings out in celebration around the globe. Here are a few facts about this festive holiday. Perhaps the best known New Year’s Eve celebration on the globe is the one that takes place in Times Square in New York City. The dropping of the lighted crystal “ball” in Times Square is witnessed live by more than one million people each year, who crowd the city streets to be a part of one of the biggest parties in the world. It is also watched on television by almost a billion viewers worldwide. It is a time-honored tradition that people have a special kiss right at the stroke of midnight. Statistics show that a full 44 percent of Americans say they expect to kiss someone at the turn of the new year. Sadly, another 22 percent of Americans will never get that kiss; they admit that they always fall asleep before midnight on this special evening. 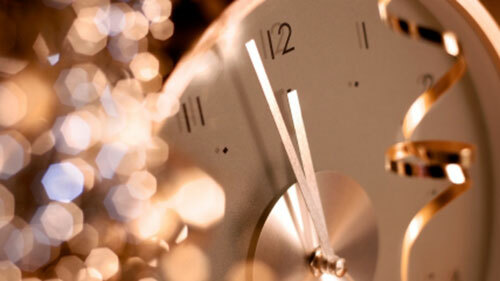 New Year’s celebrations actually date back more than 4,000 years. Even though we didn’t have the calendar as we know it, the ancient Babylonians celebrated the new year at the first full moon after the spring equinox. In ancient Egypt, the new year began each year when the Nile flooded. A new year on Jan. 1 was first instituted in the western world by Julius Caesar in 46 B.C. For those making resolutions on New Year’s, there are a few common promises that crop up time and again. Among Americans, 45 percent claim to make a resolution, and most of them are related to weight loss, getting organized, saving money, staying fit or stopping smoking. Whether you decide to spend this evening every year with a special someone or eating a lucky food in front of the television watching the “ball drop,” it is interesting to consider how this holiday has such an impact on people the world over. No doubt, it is the hope for better times and a bright future that gives it such appeal.